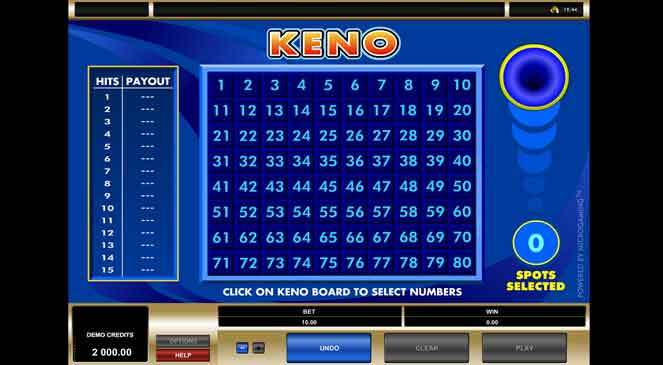 Keno is a lottery-style game that has something for everyone – excitement, thrills, instant gratification and the chance to win the kind of cash prizes that could change your life in a big, big way. It plays much like any other draw-based lottery game, but returns a whopping 94-95% of stake money to the players, which is a figure that most traditional lottery players can only dream about. You get to select as few or as many numbers as you like, up to a stated maximum, and prizes are won according to how many numbers you match. Select and match the maximum permitted quantity of numbers and you’ll win the jackpot! The game of Keno is played with 80 balls that are uniquely numbered from 1 to 80. Your aim as the player is to select anything from 1 to 15 numbers, and when you are playing online you do that by clicking your selections on a grid of squares numbered 1 to 80. When you have finished choosing your numbers, take a look at the payout schedule on the screen and you will see how much you stand to win by matching some or all of your selections. The stated prize values are based on a bet of 1 unit, so if you choose to bet more than 1 unit on the game you should multiply them accordingly. After checking that you are happy with your selections and the prize values that you are playing for, press the Play button. The game will then begin and 20 numbers will be drawn at random. Any numbers that you match will be highlighted as they appear so that you can see how much you stand to win at any point. When all of the numbers have been drawn, any prize that you are due will be added to your account automatically. Keno is an exciting game of chance. 94-95% of stake money is returned to players. No skill is required to play. Gameplay is fast and furious. Prizes are paid according to how many numbers you match. Potential profits can be life-changing.